If you are a publisher or a writer, you know the value of a content. And you strive to create great content for your readers. However, every article that you publish on the web has a life cycle. It loses its traction after its time and is slowly pushed down by new ones and finally lays unread somewhere in the archive. Every online publisher, have in some way always wanted to gain more eyeballs to their old content. However, despite their best efforts, the pageviews to most part of the archive is still not a very promising number. Well, this Indian startup, Parallel Dots is set to change that. Angam Parashar, the founder of the startup, believes that new content can gain much leverage from old content in terms of context. And if done right, it will surely make up for a far more engaging reader experience as well. Parallel Dots is aiming to solve that with intellectual timelines that suggests the right things in a seamless way. The new technology will allow publishers to show interactive timelines that will allow users to view a story in a timeline that matches the context of the topic of the article they are reading currently. Articles will feature a Timeline button which when clicked will present readers with a nice timeline filled with contextual articles from the publisher or other Parallel Dots publishers (if this publisher opts in for that). Timeline.js is one of the most popular ways of showing timelines and it surely is very nice and easy. However, the pain is updating the Google Spreadsheet with the elements of articles to show. It is tiring and manual, making it hard often to stay contextual and updated at all times. Parallel Dots will solve that with their intelligent algorithm which will choose it for you. Outbrain is already doing a great job with this kind of relevant content showcasing and is already trusted by major publishers like Reuters, CNN, Slate among many others. The Parallel Dots monetization model is also similar to that of OutBrain Amplify, which allows other publishers to show their content on timelines on your site and get traffic to their sites.The only way Parallel Dots stands out from the competition is the way they showcases the content with timelines. The startup is co-founded by Angam Parashar, Ankit Singh and Muktabh Mayank. 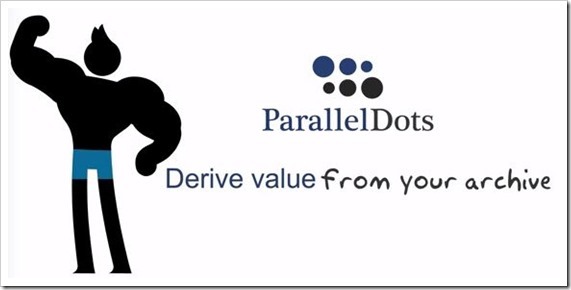 Parallel Dots is a part of Times Internet Startup Accelerator program TLabs Spring 2014 batch. The program invests Rs 10 lakhs in the inducted startups for a 10% stake. The batch is scheduled to end on June 2014.